Activity Type: Guided expedition up to the Nef Glacier that includes horseback riding, hiking and navigation. Special Considerations: No experience required but you should consider that the nature of this route requires that participants are in good health and physical condition. Suitable for children 14 years and older, with permission from their parents. Reservations: This route requires planning and advance coordination and preparation of the horses so you should make your reservation at least 15 days prior to travel. This explorer’s route to the Nef glacier begins with an hour and a half boat trip across the Bertrand and Plomo lakes. You’ll disembark at the entrance of the Soler Valley and walk a few meters to a pioneer-era farm where horses and gauchos will be waiting to ride through some of the most amazing landscapes of Patagonia, on the way to the Northern Patagonia Ice Fields. It’s an intense six hour ride from the head of the valley to the Palomar Ranch, an old gaucho outpost situated in the middle of amazing solitude and nature. You’ll ride through beautiful forests, wide open valley floors and grasslands, crossing rivers that originate in the ice. Trust in your guides and your horses; they’ve grown up in these wild lands and are used to the challenges of this trail. Follow their lead and allow yourself to get immersed in the imposing peaks of the mountains that surround you, and the edge of the forests where the acute observer is often rewarded with views of a soaring condor and even a timid huemul. At the end of the day you’ll reach the Palomar Ranch, where you’ll camp for the night, and enjoy a campfire dinner in a classic gaucho outpost, complete with "canogas", a traditional pioneer technique that involved hand hollowed logs that were been split lengthwise and overlaid to form a rustic roof. The second day of your adventure begins with some good mates and an energizing breakfast, followed by a two hour hike through the Patagonian forests and the moraine leading up to the imposing Nef Glacier. The first section of the hike follows a gaucho trail within a mature lenga forest that surrounds you with silence broken only by songbirds, or if you are truly lucky, a huemul. Then, you’ll enter a marshland and begin a 200 meter ascent up the moraine that will deposit you in front of a magical world of ice and water in a million shades of blue. It’s the northern edge of the Nef Glacier, and after a brief walk further across the moraine, you’ll reach the ice, where you will have the opportunity for a brief but unforgettable walk atop this giant 164 km2 glacier. Ready to put things in perspective? 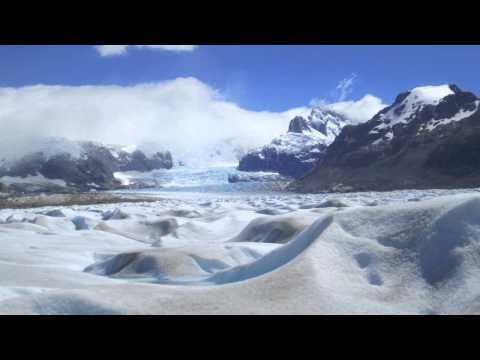 In spite of the fact that the Nef glacier is a giant, it only represents 4% of the total mass of the Northern Patagonia Ice Fields, which are an incredible 4200 km2. And if that’s not enough to impress you, consider this: the mass of the Southern Patagonia Ice Field totals four times that of its northern neighbor, 16,800 km²! Amazing, huh? Enjoy your time on the ice and a light lunch, before your return to the Palomar Camp for a hearty dinner and a good night’s sleep. On day three you’ll retrace your trail back to the Sierra family farm on the shores of Plomo Lake where you’ll have the opportunity to rest and share a few mates before meeting the boat for the return journey to Puerto Bertrand. Another option for getting to the Glacier is to cross the Nef Valley and access the ice from the southern frontal wall. The experience is equally memorable, this time crossing the Valley that shares its name with the Glacier. Head to the Tres Marías Ranch to meet your guide, Don Aquilino Olivares, and prepare yourself for a different form of adventure because in this route, you cross the mighty Baker River rowing in a wooden boat. Once on the other side, you’ll mount horses to ride to the high mountain lagoon where you can observe the frontal wall of the glacier and an amazing landscape where the eternal ices flow down from the mountains, high above. There were no roads to Caleta Tortel until 2003; thus, settlers and visitors relied on the mighty Baker River to arrive. Recreate this historic tradition, by traveling the final kilometers to Caleta Tortel, aboard a wooden, locally-crafted launch. The luxury of having your luggage transported to the dock closest to your lodging, is a welcome bonus!